Rob has worked in the natural resource management and environmental science fields since 1997. 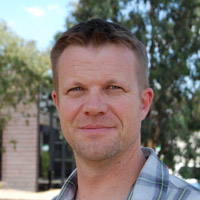 Rob has worked on a wide range of environmental research and consultancy projects as an Environmental Scientist for Federation University Australia's Centre for Environmental Management. Rob joined CeRDI in 2013 and has worked on a range of knowledge management and spatial applications in the agricultural and natural resource management sectors. Rob completed a Bachelor of Applied Science in Environmental Management at Ballarat University College in 1992 and worked for five years as a partner in the family farming business at Cavendish, Victoria. Rob has extensive experience in working with industry, all levels of government and community organisations on a wide range of natural resource management issues. Rob has developed specialist skills in Geographic Information Systems and data management. Westbrooke, M., Leversha, J., Gibson, M., O'Keefe, M., Milne, R., Gowans, S., Harding, C., & Callister, K. (2003). The vegetation of Peery Lake area, Paroo-Darling National Park, western New South Wales. Cunninghamia, 8(1), 111-128. Milne R and Hansen B (2016) Engaging communities for prioritising natural resource management and biodiversity conservation actions. Paper presented at Locate16 Conference, 13-14 April 2016, Melbourne, Victoria. Milne R (2016) Online Farm Trials - a national grains research information resource. Paper presented at Grains Research and Development Corporation Research Update Conference, 9 February 2016, Adelaide, South Australia. Dahlhaus PG, MacLeod A, McKenna K, Milne R and Thompson H (2014) Online information to maximise soil health. Poster presented at Digital Rural Futures Conference, 25-27 June 2014, Toowoomba, Queensland. Milne R, Dahlhaus PG, Nicholson C, Thompson H, MacLeod A, Feely P, McCue T, Gillett H and Corbett J (2014) Online Farm Trials: a research repository for Australian grain growers. Paper presented at Digital Rural Futures Conference, 25-27 June 2014, Toowoomba, Queensland. Milne, R. (2013). Vegetation Assessment of 'Banongil', Skipton. Ballarat, Australia: Centre for Environmental Management, University of Ballarat. Palmer, G., Westbrooke, M., Gowans, S., Milne, R., Florentine, S., & Champness, B. (2013). Ecosystem function analysis: Cypress-pine woodland. Ballarat, Australia: Centre for Environmental Management, University of Ballarat. Gowans, S., Milne, R., Westbrooke, M., & Palmer, G. (2012). Survey of Vegetation and Vegetation Condition of Toorale. Ballarat, Australia: Centre for Environmental Management, University of Ballarat. Milne, R. (2012). Mapping assessment of Phytophthora cinnamomi at Wreck Beach, Great Otway National Park. Ballarat, Australia: Centre for Environmental Management, University of Ballarat. Milne, R., & Lee, M. (2012). Sites of high environmental risk mapsheets: VicRoads Western Region. Ballarat, Australia: Centre for Environmental Management, University of Ballarat. Milne, R., Palmer, G., & Gowans, S. (2012). Grampians Peaks Trail (Stage 1) Environmental Assessment: Proposed Sundial-Mount Rosea walking track realignment, proposed Mount Rosea hikers campsite, proposed Mount Rosea walking track realignment, proposed Mount Rosea-Borough Huts walking track realignment, proposed Borough Huts-Lake Bellfield track. Ballarat, Australia: Centre for Environmental Management, University of Ballarat. Milne, R., Palmer, G., & Grundell, R. (2012). Loo-Errn Boardwalk, Wilsons Promontory National Park: Environmental impact and net gain assessment. Ballarat, Australia: Centre for Environmental Management, University of Ballarat. Palmer, G., Grundell, R., Florentine, S., Gowans, S., Milne, R., Miller, T., & Lee, M. (2012). Pest Plant Mapping and Monitoring for Greater Bendigo National Park: Kamarooka Section. Ballarat, Australia: Centre for Environmental Management, University of Ballarat. Gowans, S., & Milne, R. (2011). Keilor Park Drive Bridge, over Albion-Broadmeadows Rail: Desktop Environmental (Flora & Fauna) Assessment. Ballarat, Australia: Centre for Environmental Management, University of Ballarat. Milne, R. (2011). Calder Highway, Marong-Bendigo: Flora and Fauna Desktop Assessment. Ballarat, Australia: Centre for Environmental Management, University of Ballarat. Milne, R. (2011). Environmental Assessment and Net Gain of Proposed Housing Development, Hocking Avenue, Mount Clear. Ballarat, Australia: Centre for Environmental Management, University of Ballarat. Milne, R., Gibson, M., Palmer, G., & Lee, M. (2011). 'Ngootyoong Mirring, Ngootyoong Mara' South West Management Plan: Review and Evaluation of Ecological Knowledge. Ballarat, Australia: Centre for Environmental Management, University of Ballarat. Gibson, M., Palmer, G., & Milne, R. (2010). Goulburn Valley Freeway Shepparton Bypass - Investigative Biological Survey and Habitat Study. Ballarat, Australia: Centre for Environmental Management, University of Ballarat. Gibson, M., Palmer, G., Milne, R., & Gowans, S. (2010). Ecosystem Function Monitoring 2006-2010. Ballarat, Australia: Centre for Environmental Management, University of Ballarat. Gowans, S., Milne, R., & Warnock, A. (2010). Vegetation Assessment: Lots 18 and 19, 319a Richards Street, Ballarat East. Ballarat, Australia: Centre for Environmental Management, University of Ballarat. Milne, R. (2010). Great Ocean Walk, Native Vegetation Net Gain Assessment: Moonlight Valley to Twelve Apostles Proposed Track Realignments. Ballarat, Australia: Centre for Environmental Management, University of Ballarat. Milne, R. (2010). Vegetation Assessment: Proposed Subdivision Access Road Cardigan Village Hadden-Windemere Road. Ballarat, Australia: Centre for Environmental Management, University of Ballarat. Milne, R., Gibson, M., & Lee, M. (2010). Mount Rosea Hikers Camp, Grampians National Park: Flora, Fauna and Net Gain Assessment. Ballarat, Australia: Centre for Environmental Management, University of Ballarat. Milne, R., & Lee, M. (2010). Ecological Values and Impact Assessment: Proposed Addiscot Beach Access Track Great Otway National Park. Ballarat, Australia: Centre for Environmental Management, University of Ballarat. Milne, R., & Lee, M. (2010). Weed Database and Maps. Ballarat, Australia: Centre for Environmental Management, University of Ballarat. O'May, J., Harman, J., & Milne, R. (2010). Grow West Landholder Survey - Myrniong and Korkuperrimul Creek Biolinks. Ballarat, Australia: Centre for Environmental Management, University of Ballarat. Warnock, A., & Milne, R. (2010). Moorabool Biolink Investigation. Ballarat, Australia: Centre for Environmental Management, University of Ballarat. Lee, M., & Milne, R. (2009). Pyrenees Highway (Section 2, Ch 10.100 - 10.450 km) and Symes Road Intersection Safer Roads Infrastructure Program Project: Flora, Fauna and Habitat Hectare Investigation. Ballarat, Australia: Centre for Environmental Management, University of Ballarat. Lee, M., Milne, R., & Gibson, M. (2009). Mid-Loddon Sub-Catchment Action Plan 2009-2014. Ballarat, Australia: Centre for Environmental Management, University of Ballarat. Milne, R., Gibson, M., & Lee, M. (2009). Great Ocean Walk, Environmental Impact Assessment: Moonlight Valley to Twelve Apostles Proposed Track Realignment. Ballarat, Australia: Centre for Environmental Management, University of Ballarat. Milne, R., Palmer, G., & Gibson, M. (2009). Environmental Impact Assessment of the Great Ocean Walk: Great Otway National Park and Port Campbell National Park. Ballarat, Australia: Centre for Environmental Management, University of Ballarat. Gowans, S., Milne, R., O'May, J., & Palmer, G. (2008). Prioritisation of review of Roadside Conservation Management Plans. Ballarat, Australia: Centre for Environmental Management, University of Ballarat. Lee, M., & Milne, R. (2008). McIvor Hwy at Ch.140.750 - 141.100 km - Axe Creek Bridge (SN2412) - Rural Arterial Bridge Project. Ballarat, Australia: Centre for Environmental Management, University of Ballarat. Milne, R., & Lee, M. (2008). Pyreness Highway (Section 2, Ch 9.98 - 14.80 km) Safer Roads Infrastructure Program; Flora, Fauna and Habitat Hectare Investigation. Ballarat, Australia: Centre for Environmental Management, University of Ballarat. Palmer, G., Munawar, S., Gibson, M., & Milne, R. (2008). Grow West Biodiversity Monitoring Project. Ballarat, Australia: Centre for Environmental Management, University of Ballarat. Pigott, P., & Milne, R. (2008). Management Plan for Remnant Vegetation Offsets at 'Banongil Station', Skipton. Ballarat, Australia: Centre for Environmental Management, University of Ballarat. Gibson, M., & Milne, R., (2007). Viewshed Analysis of Proposed Windfarm at Tuki Farm. Ballarat, Australia: Centre for Environmental Management, University of Ballarat. Milne, R. (2007). Moorabool Shire Biodiversity Habitat Mapping. Ballarat, Australia: Centre for Environmental Management, University of Ballarat. Milne, R., & Gibson, M. (2007). Vegetation Assessment: Crown allotments 7,119, 121, 122, 123 (Part) 124A Section 14, Crown Allotment 12c Section 15, Crown Allotment 507 (no section), Western Highway, Ararat. Ballarat, Australia: Centre for Environmental Management, University of Ballarat. Milne, R., & Gibson, M. (2007). Vegetation Assessment: Proposed Subdivision, Corner Duggan St and Boronia Rd, Black Hill. Ballarat, Australia: Centre for Environmental Management, University of Ballarat. Milne, R., & Kendal, L. (2007). City of Ballarat Environmental Sustainability Strategy. Ballarat, Australia: Centre for Environmental Management, University of Ballarat. Milne, R., & O'Keefe, M. (2007). Pyrenees Highway Curve Realignment - Flora, Fauna and Habitat Hectare Assessment. Ballarat, Australia: Centre for Environmental Management, University of Ballarat. Milne, R., & Pigott, J.P. (2007). Ground Truthing of Default Habitat Hectare Score Mapping. Ballarat, Australia: Centre for Environmental Management, University of Ballarat. Palmer, G., D'Ombrain, T., Gibson, M., Milne, R., Leversha, J., Gowans, S., & Pigott, J.P. (2007). Corangamite Vegetation Assessment Survey. Ballarat, Australia: Centre for Environmental Management, University of Ballarat. Milne, R. (2006). Habitat Tree Inspection: Western Highway. Ballarat, Australia: Centre for Environmental Management, University of Ballarat. Milne, R., & Kendal, L. (2006). Draft City of Ballarat Environmental Sustainability Strategy. Ballarat, Australia: Centre for Environmental Management, University of Ballarat. Milne, R., Palmer, G., & Leversha, J. (2006). Framework for Achieving Net Gain in Native Vegetation through Roadside Management. Ballarat, Australia: Centre for Environmental Management, University of Ballarat. Palmer, G., Callister, K., Baker, B., Milne, R., Gibson, M., & Szigethy-Gyula, J. (2006). Ecological report on compliance with FFG Act permit conditions during removal of aerial signal infrastructure within biosites on the Melbourne to Ballarat line. Ballarat, Australia: Centre for Environmental Management, University of Ballarat. Palmer, G., O'May, J., Gibson, M., & Milne, R. (2006). Proposed Bellarine Lakes Village, 402-404 Bellarine Highway, Moolap: Environmental Management Plan. Ballarat, Australia: Centre for Environmental Management, University of Ballarat. Westbrooke, M., Gibson, M., & Milne, R. (2006). Preliminary assessment of risk for further seismic survey within Battersby and Bulley Blocks, Lower Glenelg National Park. Ballarat, Australia: Centre for Environmental Management, University of Ballarat. Gowans, S., Leversha, J., & Milne, R. (2005). Mount Mercer Nature Conservation Reserve: The Role of Disturbance Regimes in Maintaining Biodiversity. Ballarat, Australia: Centre for Environmental Management, University of Ballarat. Gowans, S., Leversha, J., & Milne, R. (2005). Victorian Volcanic Plains Grasslands Glenelg Hopkins Study: The Role of Disturbance Regimes in Maintaining Biodiversity. Ballarat, Australia: Centre for Environmental Management, University of Ballarat. Milne, R. (2005). Strategic Assessment of Fragmentation of Parks and Reserves by Roads and Tracks: Supplementary Information on the Level of Fragmentation of Box-Ironbark Parks and Reserves by Roads and Tracks. Ballarat, Australia: Centre for Environmental Management, University of Ballarat. Milne, R., D'Ombrain, T., & Leversha, J. (2005). Native Vegetation Mapping and Review of the Vegetation Protection Overlay (VPO1). Ballarat, Australia: Centre for Environmental Management, University of Ballarat. Westbrooke, M., Gibson, M., Milne, R., Gowans, S., Callister, K., Florentine, S., & Whittle, D. (2005). The Vegetation of Gundabooka National Park, Western New South Wales. Ballarat, Australia: Centre for Environmental Management, University of Ballarat. Draper, R., Gowans, S., Gibson, M., Baker, B., & Milne, R. (2004). Wetland Dependent Fauna in the Birchip Area, North-west Victoria. Ballarat, Australia: Centre for Environmental Management, University of Ballarat. Milne, R. (2004). Restoration of Dryland Ecology, Ephemeral Waterways and Wetlands: A Research Audit. Ballarat, Australia: Centre for Environmental Management, University of Ballarat. Milne, R., & Gibson, M. (2004). Strategic Assessment of Fragmentation of Parks and Reserves by Roads and Tracks: Phase 3 - Risks and Values. Ballarat, Australia: Centre for Environmental Management, University of Ballarat. Milne, R., Gibson, M., & Kendal, L. (2004). Enhanced Management of Environmental and Cultural Heritage Management Assets on Roadsides. Ballarat, Australia: Centre for Environmental Management, University of Ballarat. Milne, R., & Ross, J. (2004). Craigieburn Grassland Nature Conservation Reserve - Land Use History and Grazing Management Guidelines. Ballarat, Australia: Centre for Environmental Management, University of Ballarat. Harding, C., Gibson, M., Milne, R., & Callister, K. (2003). Gap Analysis - Identification of Priority Sites for the Establishment of Protected Areas Network: A Database Approach - Port Phillip Region. Ballarat, Australia: Centre for Environmental Management, University of Ballarat. Baker, B., Douglas, S., & Milne, R. (2002). Assessment of the Environmental Risks of the Proposed Six Peaks Walking Track in Mount Cole State Forest and Mount Buangor State Park. Ballarat, Australia: Centre for Environmental Management, University of Ballarat. Gibson, M., Milne, R., Cahill, D., Wilson, B., & Baker, B. (2002). Preliminary Review of the Actual and Potential Distribution of Phytophthora cinnamomi Dieback in Parks and Reserves Across Victoria. Ballarat, Australia: Centre for Environmental Management, University of Ballarat. Leversha, J., Irvin, M., Milne, R., Gibson, M., Kerr, M., & Harding, C. (2002). Proposed High Voltage Transmission Line Between South Australia and New South Wales (SNI) Environmental Impact Statement - NSW Flora and Fauna Assessment, Northern Route (Ammended). Ballarat, Australia: Centre for Environmental Management, University of Ballarat. Milne, R., & Gibson, M. (2002). Leigh Catchment Project Database. Ballarat, Australia: Centre for Environmental Management, University of Ballarat. Milne, R., & Gibson, M. (2002). Strategic Assessment of Fragmentation of Parks and Reserves by Roads and Tracks: Phase 2 - Level of Fragmentation of Parks and Reserves by Roads and Tracks. Ballarat, Australia: Centre for Environmental Management, University of Ballarat. Milne, R., & Harding, C. (2002). Great Ocean Walk Development Risk Assessment: Otway National Park. Ballarat, Australia: Centre for Environmental Management, University of Ballarat. Milne, R., & Kerr, M. (2002). Great Ocean Walk Environmental Values Assessment: Otway National Park. Ballarat, Australia: Centre for Environmental Management, University of Ballarat. Westbrooke, M., Leversha, J., Gibson, M., Milne, R., Gowans, S., Harding, C., & O'Keefe, M. (2002). The Vegetation of Peery National Park Western New South Wales. Ballarat, Australia: Centre for Environmental Management, University of Ballarat. Hadden, S., & Milne, R. (2001). Murray Central Reserves Baseline Assessments. Ballarat, Australia: Centre for Environmental Management, University of Ballarat. Kerr, M., & Milne, R. (2001). Great Ocean Walk, Port Campbell National Park: Development Risk Assessment. Ballarat, Australia: Centre for Environmental Management, University of Ballarat. Leversha, J., Milne, R., Gibson, M., Brown, G., & Kerr, M. (2001). Proposed High Voltage Transmission Line Between South Australia and New South Wales (SNI) Environmental Impact Statement. NSW / VIC Flora and Fauna Impact Working Paper. Ballarat, Australia: Centre for Environmental Management, University of Ballarat. Kerr, M., Milne, R., & Gibson, M. (2000). Vegetation Mapping Study. Ballarat, Australia: Centre for Environmental Management, University of Ballarat. Westbrooke, M., Kerr, M., Leversha, J., Gibson, M., Milne, R., Hadden, S., & Gowans, S. (2000). Vegetation Survey of the Proposed Extension to Mungo National Park. Ballarat, Australia: Centre for Environmental Management, University of Ballarat. Gibson, M., Leversha, J., Prevett, P., & Milne, R. (1999). Koala Habitat Assessment. Ballarat, Australia: Centre for Environmental Management, University of Ballarat. Kerr, M., Milne, R., & Gibson, M. (1999). Vegetation Mapping Study. Ballarat, Australia: Centre for Environmental Management, University of Ballarat. Milne, R., Kerr, M., & Gibson, M. (1999). Great Ocean Walk, Port Campbell National Park: Environmental Values Assessment. Ballarat, Australia: Centre for Environmental Management, University of Ballarat. Milne, R., O'May, J., Ross, J., Heislers, A., & Saunders, D. (1999). Mid-term review of the Natural Heritage Trust: Indigenous protected areas program. Ballarat, Australia: Centre for Environmental Management, University of Ballarat. Milne, R., O'May, J., Ross, J., Heislers, A., & Saunders, D. (1999). Mid-term review of the Natural Heritage Trust: National reserve system program. Ballarat, Australia: Centre for Environmental Management, University of Ballarat. Milne, R., O'May, J., Ross, J., Heislers, A., & Saunders, D. (1999). Mid-term Review of the Natural Heritage Trust: World Heritage Management Program. Ballarat, Australia: Centre for Environmental Management, University of Ballarat. Milne, R., Westbrooke, M., Norman, L., Jackson, J. & O'May, J. (1999). Terrick Terrick National Park Land Use History and Grazing Management Guidelines. Ballarat, Australia: Centre for Environmental Management, University of Ballarat. Gibson, M., Kerr, M., Milne, R., & Wilcock, P. (1998). Strategic Assessment of Condition of Vegetation in Victorian Parks. Ballarat, Australia: Centre for Environmental Management, University of Ballarat. Leversha, J., Milne, R., Capicchiano, L. & Brown, G. (1998). ETSA Transmission / TransGrid Riverlink (SANI) Project Environmental Impact Statement: Preliminary Flora and Fauna Study. Ballarat, Australia: Centre for Environmental Management, University of Ballarat. Milne, R., & Miller, J. (1997). Wimmera Catchment Regional Vegetation Plan. Ballarat, Australia: Centre for Environmental Management, University of Ballarat. Online Farm Trials cropping research data and knowledge management technology. Corangamite Natural Resource Management spatial planning portal. State-wide Flora and Fauna Teams citizen science technology platforms. Victorian Volcanic Plains linear reserves knowledge base and spatial portal. Leadbeater's Possum interactive spatial portal. Corangamite soil health knowledge base and spatial portal. Soil moisture probe data visualisation interface.